‘The Incredibles’ writer/director Brad Bird has said that his characters’ powers are all born of stereotypes. Dad is strong, mom is stretched in a million directions, teenage girls put up shields, little boys are full of boundless energy and babies are unpredictable. It’s why he decided that for the sequel, “Incredibles 2 ,” a buoyant and quick-witted romp, he’d pick up right where we left off, in that parking lot after Dash’s track meet where a new threat emerges from underground. No matter that in reality, 14 years had actually passed. Animation is not bound by time or aging actors. For the rest of us, however, 14 years is still 14 years. And in the past 14 years, the business of Hollywood has become the business of superhero movies. It’s hard to remember a time when there weren’t a dozen a year. But when “The Incredibles” came out in 2004, they were still a bit of an anomaly at the multiplex — its cheeky, mockumentary realism, its jokes about capes, secret identities, “monologue-ing” and the dangers of toxic, obsessive fandom was the perfect introduction (and indoctrination) to superheroes for those who couldn’t care less. Pixar magic made superhero believers out of the skeptics. And by 2008, we all thought, sure, let’s see about this Tony Stark fellow and someone called Iron Man. In “Incredibles 2,” it seems like Bird himself is wrestling with a culture he helped facilitate — not totally dissimilar to what Steven Spielberg did earlier this year in “Ready Player One.” But instead of nostalgia on trial, it’s superheroes and screens. The villain here is called Screenslaver, who uses screens to hypnotize anyone watching. It’s both the most retro plan of all (keeping with Bird’s love of the 60s aesthetic) and still somehow utterly modern. Annoyed by how blindly and wholly consumerist everyone has become at the mercy of screens and simulated experiences in lieu of real ones, from movies to video games, Screenslaver has set out to end that, and squash Municiberg’s dependence on and obsession with superheroes. As with the first, there are a million ideas at play here (not a flaw, by the way), including evolving family dynamics. Most of the original voice cast has returned, including Craig T. Nelson as Bob Parr/Mr. Incredible, Holly Hunter as Helen Parr/Elastigirl, Bird as Edna Mode, Sarah Vowell as Violet Parr and Samuel L. Jackson as Lucius Best/Frozone (the only slight change in the main players is that Dash Parr is now voiced by Huck Milner). And once again, superheroes are still on shaky ground in Municiberg and are put on ice after the Parr family accidentally damages some public property while trying to take down a criminal. But a wealthy heir and superhero appreciator Winston Deavor (Bob Odenkirk) and his tech savvy sister Evelyn (Catherine Keener) have a plan to rehabilitate their image. Right now, the public only sees the destruction. The Deavors propose outfitting superheroes with body cams to get exciting footage of their feats. “Incredibles 2” provides a bit of a corrective on a micro level to the first film’s gender politics by sending mom off to work and making dad stay home (although wasn’t that a little antiquated 35 years ago?). The animation is also a heck of a lot better. “The Incredibles” looks downright primitive and even a tad ugly in retrospect. Although it gets off to a slow start, ultimately it’s also quite a bit of fun, from the absurd (Jack Jack’s burgeoning powers) to the grounded (Dad helping Dash with his math homework or trying to make up for getting in the way of Violet’s date and embarrassing her even further in the process). Like “Ready Player One,” however, “Incredibles 2,” kind of loses the thread by the end. A villain is a villain no matter how salient their point, and Mr. Incredible, Elastigirl and their offspring are our heroes and thus we must root for them even while thinking that Screenslaver might be on to something. It’s still fun to watch smart storytellers like Bird working within the system and using his platform to self-evaluate or comment on what’s going on, even if the conclusion is a little flimsy. Bird could have easily just brought back his lovable characters, leaned on Jack Jack’s antics and cashed in the check. It makes the effort and care here seem even more incredible. 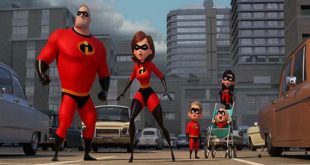 After a glut of lucrative box office juggernauts from its Marvel Cinematic Universe, Disney is looking to break more records with “Incredibles 2,” the long-awaited return of a quirky animated superhero family. The film — which comes out Friday, a full 14 years after “The Incredibles” — looks set to score the highest debut ever for an animated film at the North American box office. Experts are predicting a $140 million-plus opening weekend for Brad Bird’s sequel to his own hugely popular original, which would surpass the $135 million debut of its Disney-Pixar stablemate, “Finding Dory” (2016). “For a very long time, people have been wanting this film,” Jackson, who returns as superhero Frozone, told reporters at last week’s glittering premiere in Hollywood. It all goes a bit awry — as it always does — when a new villain emerges with a brilliant and dangerous plot that threatens the world. “It’s kind of like a spy movie — ultra, uber-sophisticated, kind of 1960s, free-wheeling,” Hunter told a question-and-answer forum at the AMC Century City movie theater in Los Angeles. There may be a 14-year gap, but the sequel starts about five seconds after the original ended, with the Parr family donning their superhero masks, ready to face the new threat. “We left people wanting more at the end of the last film… There was this villain, everyone wanted to see what the outcome was with that fight,” said producer Nicole Grindle. Critics and fans who made it to the premiere were allowed to post social media reactions, with most singling out the Parrs’ scene-stealing baby for praise. “’Incredibles 2’ is a blast. It does a great job building on the characters and the world, and it’s super funny and action packed throughout,” tweeted Eric Eisenberg of CinemaBlend.